The readers spoke and wanted to know about some great apps that are available for both Android and iOS devices (namely iPod touch and iPhones) and I've found one for you! This Walt Disney World Pictures app is great for using as wallpapers and backgrounds! And at under a dollar it is a steal for high quality, beautiful pictures from around the parks and resorts. Photographers Tom Bricker, Cory Disbrow, Paul Gowder, and Matt Pasant compiled this resource of over 110 images for your use on your devices! 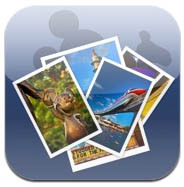 This app has a simple user interface and it is easy to use and utilize the images. WDW Pics was developed by PowWows.com and is brought to you by Where in Disney World?- check them out on Facebook! Both version of the app can be easily found in the appropriate stores (Google Play on Android and the App Store & iTunes on iOS). I highly recommend this to anyone who has searched in the past but couldn't quite find that Disney background they were looking for. There are so many to chose from I keep changing mine everyday!